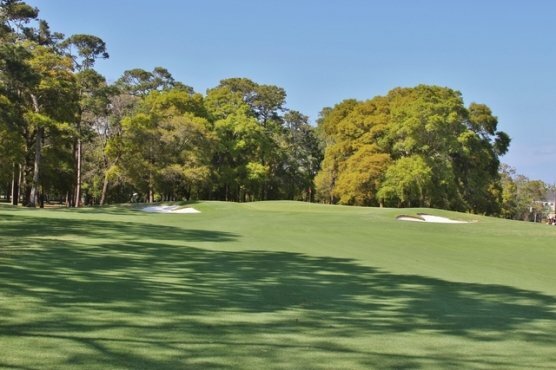 The 2015 Hootie and the Blowfish Monday after the Masters is scheduled to be played April 13 at Barefoot Resort’s Dye Club. This will be the 21st annual tournament which helps fund junior golf and educational programs in South Carolina through the charitable Hootie Foundation. Last year organizers stated that the event was responsible for $461,000 in donations. For the fifth consecutive year, ESPN’s Mike and Mike in the Morning Show will be broadcasting live from the Monday after the Masters in North Myrtle Beach. This year’s field is coming together and a few new participants have been announced. NASCAR driver Denny Hamlin, comedian Larry the Cable Guy and recently retired NBA player Shane Battier are set to make their debuts in this year’s event. Other first time participants that have committed include NBA players Detlef Schremph and Spud Webb, former New York Yankee Jim Leyritz, Detroit Lions wide receiver Golden Tate and actress Debbie Dunning, who played on the ABC television series Tool Time. The professional lineup is outstanding and leading the way are returners Davis Love III who will be captaining the 2016 Ryder Cup team, 16- time PGA Tour winner Jim Furyk and 2013-2014 FedExCup champion Billy Horschel.